In between the shadows and a bit of distortion from my scanner, the striking EVB livery on this 628 at Bremerhaven Hbf on 16.2.02 has lost much of its effect! With daylight starting to lengthen just a little, it was time to get back on the trail, this time in the ‘unknown’ (to me) north of Schleswig-Holstein. I’d been trying to keep to a policy of concentrating on geographical areas for a while. The last deserts now were in the north west and the far south of the country, so having decided to leave the best beer, I mean scenery, until last, it was off ‘oop north’ to start spreading some red ink! This was the first stage of the process, the remainder being 3 weeks later. First outing for 2002, and the first to ‘Euroland’. Fed up with Lloyds TSB’s punitive charges for using ATMs abroad I went armed with a wad of €s from the Post Office. My long suffering wife provided me with a lift to Telford Central where an unheated 156 arrived 8 minutes late. The 0649 Euston was still waiting at 0653 at Wolves; stupidly I didn’t get on it, fearing I might get caught between the two. After some considerable delay we set off to Portobello Jn due to ‘track problems between Wolverhampton and Birmingham’. This was at least more convincing than the station announcer’s offer for the 0652 local – ‘points failure at Marston Green’. Are there any points at Marston Green? I think not. On arrival at BNS at 0724 the 0715 Euston was still there; this time I dived in, only to be told that it would be delayed and 0733, which doesn’t officially stop at Coventry, would go first. I gave up and caught 0736 Silverlink, arriving at work at 0830. Left at 1630 for the 1709 Tile Hill - Birmingham Irrational which was only slightly late. In transit between BI and BHX the new vehicles for the Maglev replacement were noted. Very small (perhaps two car lengths or a little more) but still articulated. A short but comfortable night’s kip at the Y then off to D-Hbf for the 0649 to Essen. A minor change to the plan (which was to go to Gelsenkirchen via Oberhausen) in order to do Essen-Gelsenkirchen which is still required, at least according to the map! Light is just appearing at Duisburg so should be OK by Essen. Which it was. Minor concerns with 0744 Münster which was booked off P9, an inset platform at the east end. This was advertising 0717 Dortmund with a ‘please listen for announcements’. 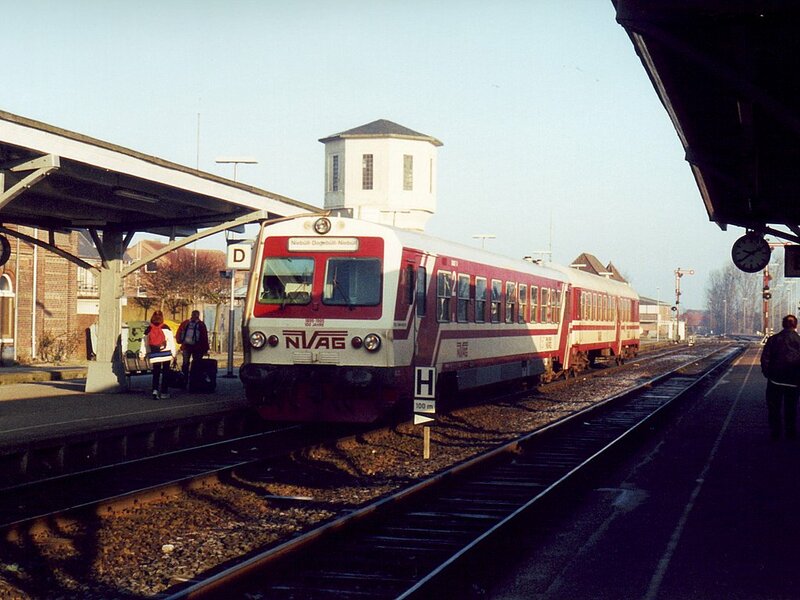 0744 was eventually announced as P10 and arrived saying it was going to Essen; everybody left the train. The other happy campers all piled in, however, and despite the internal displays still saying ‘n. Essen Hbf’ we set off about 8 minutes late for an enthralling (not) ride to Münster which was reached at 0851, 3 late but allowing time for some very welcome mayo-free breakfast. Another equally enthralling ride to Osnabrück on an RB which seemed to have redefined the concept of limiting friction. When it stopped, it really stopped… 43 minutes at Osnabrück Hbf was easily 39 too long, though to be fair to Osnabrück it looks as if O-Hbf is stuck on the edge of town and it looked a lot more interesting around O-Hasetor. The NNB kart to Delmenhorst and Bremen is the usual low-floor brute, but it’s warm, comfortable and it’s got great big windows so no complaints! [This line was one I’d missed through planning ineptitude some time back, and though once slated for closure it’s now got a much better service from MWB than ever DB gave it.] It took the junction at Eversburg at sufficient speed for quite a good lurch. The line is double to Bramsche then single. The Oldenburg and Delmenhorst lines separate north of Hesepe. Just south of Hesepe there is an oil siding which appears well used. I didn’t see the Dinklage branch at Lohne but the remaining portion of the Vechta to Ahlhorn line has been lifted. There are physical connections to and from the branch west of Delmenhorst but it would be interesting to know if anything other than the branch trains use P1 at Delmenhorst. On time arrival at Bremen provided time for a very hasty McDonalds before the 1310 to Bremen-Vegesack, a short electrified branch off the Bremerhaven/Cuxhaven line. The physical junction is just south of Bremen-Burg. The branch is mostly suburbia although it does lead (via reversal at Vegesack) to several freight branches. 111137 provided the haulage of a 4 car double deck set. Lucky escape here I think - it had a couple of delays on the way back from Vegesack, one quite lengthy, and was a bit late at Bremen Hbf. It was still at Bremen Hbf when I left on 1432 to Bremerhaven-Lehe so had presumably failed. A very pleasant run up to Bremerhaven though possibly on a less sunny day it would have been a bit dreary. 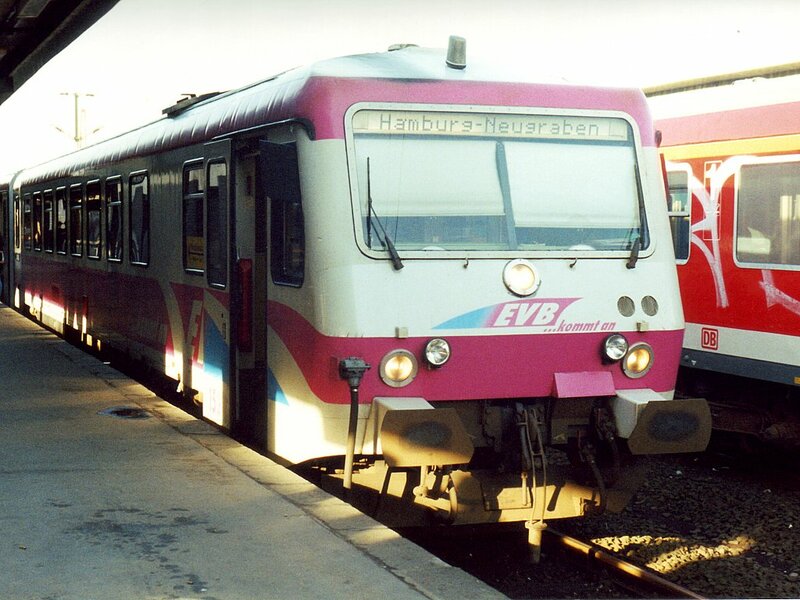 Arrival at Bremerhaven Hbf was on time (big painting of 103115 in the subway) and the EVB kart for Hamburg-Neugraben was waiting. This was an ex-DB 628 in a peculiarly hideous pink and white livery which needs to be seen to be believed. Watch out Prignitzer Eisenbahn - you’ve got competition. Saw the second Siemens Dispolok of the afternoon (ES64-U2-004) at Bremerhaven, 001 having passed through Bremen-Burg on a southbound freight. Another pleasant trundle in the afternoon sun, though it does seem to take a long time. Bremervoorde seems to be the EVB headquarters with a splendid assortment of ancient railcars plus an ex-DB freight loco (345? ), a Rabbit and something resembling a V200. On time arrival at HH-Neugraben made for an easy connection to the 1730 S-Bahn to Hamburg-Altona via the southern (underground) route. Daylight lasted satisfactorily until we went underground at Hamburg Hbf so hour was entirely satisfied. Nothing for it then but a long wait for the 1929 to Husum, Rabbit propelled and at the time of writing 5 minutes late. I had directions from the DB website and finding the Hotel Am Schlosspark was straightforward. Just 20 minutes walk from the station but didn’t seem that far as it’s quite an interesting walk through the town. A fishing port/market town, apparently undamaged and very likeable. Hotel was fine too and does breakfast at 0700 even on Sunday - fine for the 0801. Bleak? No! Well, maybe a bit ... Dagebüll Mole on the cold morning of 17.2.02. Another fine cold (-1) morning. Decent breakfast with plus points for orange juice and marmalade! An enjoyable walk to the station too, marred only by the notice at the home brew establishment saying it was shut on winter Sundays. Rabbits much in evidence at the station, seemingly having a monopoly on the Hamburg-Westerland route. My train turned up a few minutes early, unsurprisingly as it has ‘TwinRabbit MegaPower’. At Niebüll the NVAG kart (maroon and ivory, far more tasteful) and trailer were waiting and we set off to Dagebüll Mole at a stately pace once the conductor had relieved me of €7.60 for the return trip. Yet more completely flat countryside though with its own charm on a sunny morning with a bit of mist. At Dagebüll Mole the kart runs on to the quayside alongside the ferry, making for satisfactory phots. There is a hotel/pub though whether turning up on spec is advisable seems doubtful, especially in summer. The size of the parking/marshalling area suggests there is quite a lot of traffic to the islands. On its return from Dagebüll Mole the NVAG train reversed in the headshunt to gain the main line at Niebüll. On the return the conductor caused alarm (to me at least) by announcing all the connections as we approached Niebüll NVAG but enquiry elicited that we were in fact going on to Niebüll DB and only one person fell for it (in fact an elderly lady, the one passenger who looked least able to carry her bags across, which seemed a bit unfair. I was left fairly unimpressed.) There’s a fairly short rounding loop on the headshunt; presumably the summer ICs lose some coaches either at Hamburg or Niebüll. On to Westerland with another two Rabbits, top and tail this time. The causeway was a bit disappointing as it was foggy and you couldn’t see anything but mud. I suspect the same applies when it’s not foggy… Nothing too remarkable about Westerland at first sight - a big modern resorty sort of place. As I was stuck for 70 minutes I set off through the town centre towards the beach thinking I might find a pub open. There were several in fact, but when I got to the ‘front’ there was a vast sandy beach with several hundred people walking (themselves, and in many cases their dogs). I decided to join them and did a very satisfactory mile or so before returning too late for the pub, and indeed for the 1114 to Niebüll which I had intended to catch to alleviate the boredom! I settled for the 1136 Hamburg which was the original plan. It had top and tail Rabbits, with 430 at the rear. How right I was. The fog had cleared coming back and yep, nothing but mud. Some Flensburger Dunkel purchased at Westerland helped to while away the ‘dead track’ back to Husum, though a bit too burnt-tasting for my liking. I continued on the same train to Elmshorn, suitably impressed by the Kiel/Nord-Ostsee canal crossing which is basically huge embankment/long viaduct/huge embankment. I’d woken up last night to find the train 100ft up in the dark, but it’s worse in daylight because you can see all the way down. This prompts you to reflect that trains can’t fly too well. From Elmshorn I continued on the 1435 RB, electrically hauled to Neumünster where the RE to Flensburg was noted to be a kart. I had a stroll into the town which looked prosperous if a tad modern. The 1535 RB to Heide (Holst.) is an AKN lart (2 car low floor) so we’ll see how the SWT does. 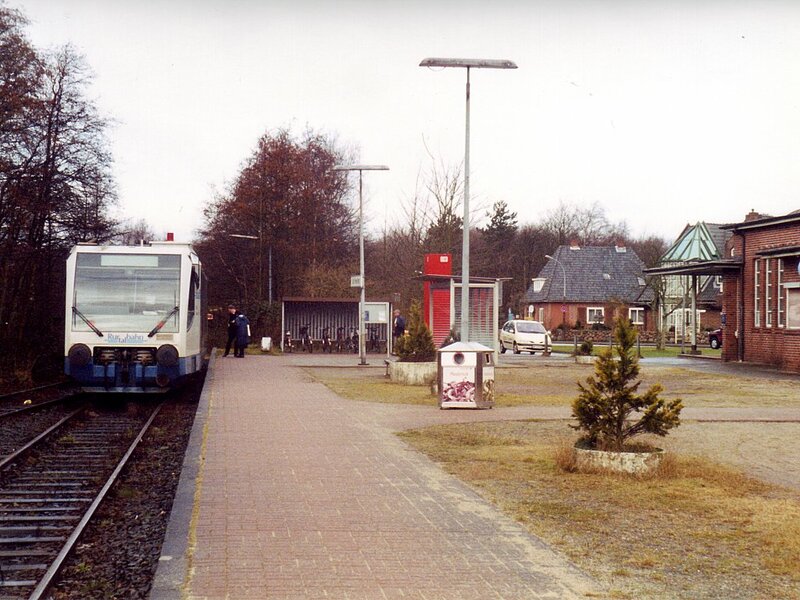 The 'branch' platforms at Heide (Holstein) on 17.2.02, with an AKN 2-car unit about to return to Neumünster. The track in the foreground is the Hamburg-Niebüll main line. It wasn’t checked, so don’t know yet. The Neumünster-Heide stretch did feature some ground more than 10 feet above sea level so was slightly more interesting. The Kiel canal crossing was in one of these stretches so it was less dramatic than the main line one as it only had to rise slightly to get enough clearance. The bridge itself is a comparatively recent and very robust looking steel and concrete structure. 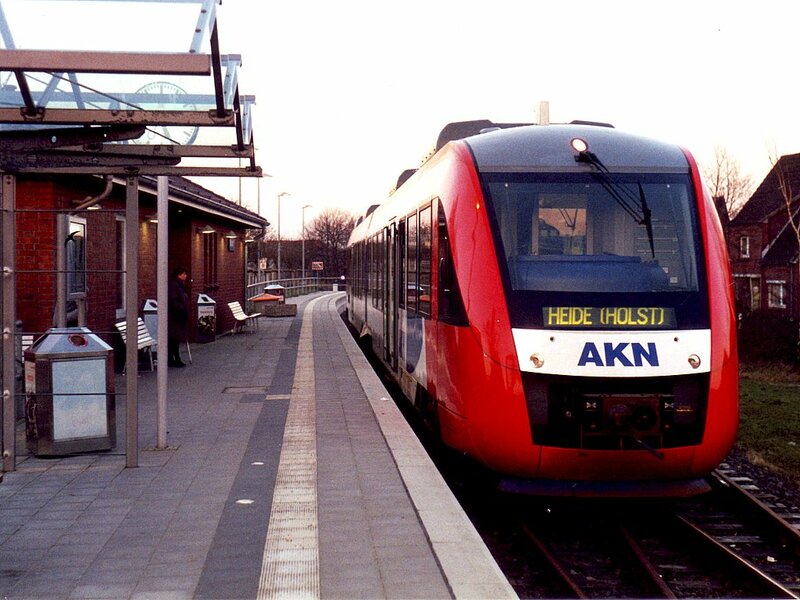 At Heide the AKN trains (for ‘twas one of theirs to Büsum too) use separate platforms 102 and 103 but join the main line just north of the station then diverge and dive under a mile or so north. I arrived on 103 and left from 102 but with satisfactory overlap! The short run to Büsum is back to the usual standard of featureless-ness with a new single platform terminus (and a very rusty rounding loop) at Büsum. The short freight branch at Büsum is also heavily rusted and looks to be obstructed. 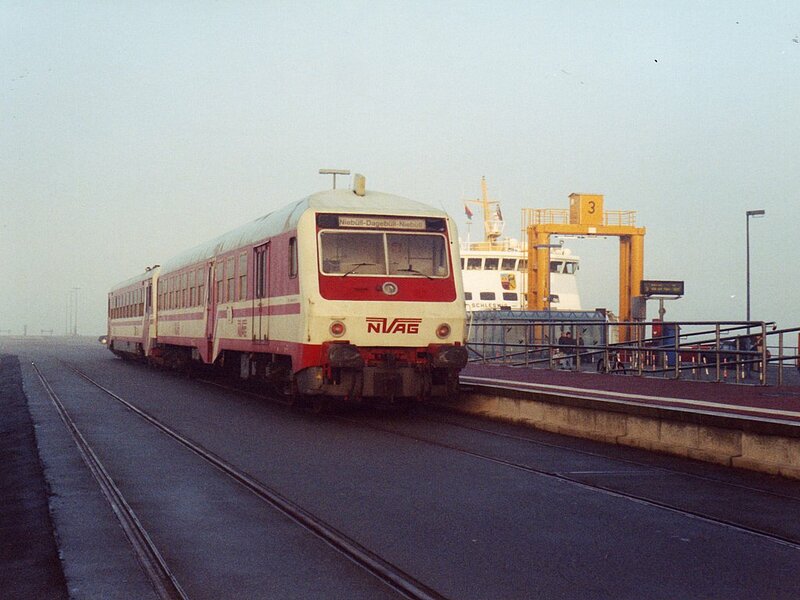 There seemed to be a problem with the unit at Büsum - much running round by the driver and a 6 minute late departure. Despite some serious thrashing on the way back we arrived back at Heide 3 minutes late at 1759, just in time to watch the hoped-for 1757 to Westerland disappear. Incidentally closer inspection on the return suggests that although there is a crossover (used) between Büsum and Westerland lines, the trains run separately as there are three tracks. The last photo of the day (note the platform lights!) 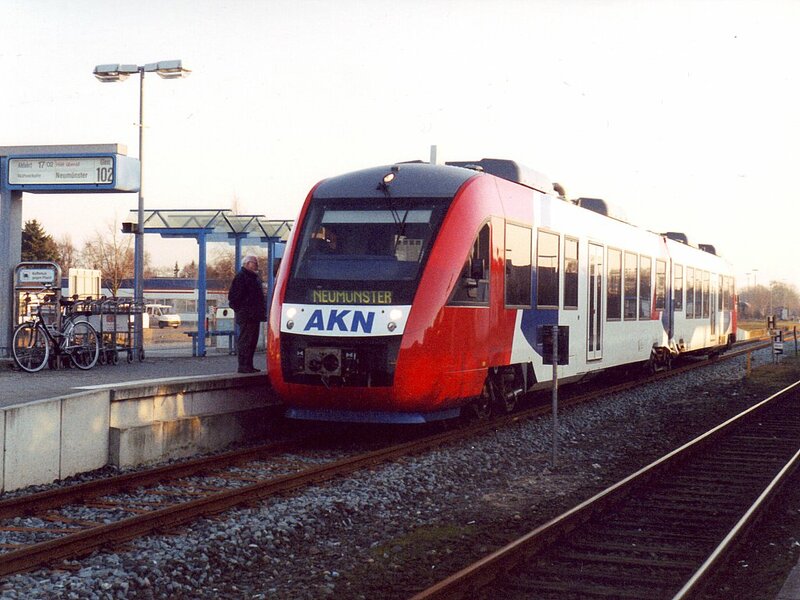 catches another AKN unit at Büsum, the terminus of the other branch from Heide. Final train of the day was another Rabbit on the 1826 RB to Husum where an excellent schnitzel was taken at Aunt Jenny’s beside the harbour, accompanied by a Franziskaner. All in all, a most satisfactory day with only the home brew missing! Late start today, awaiting the 0900 start of the Schleswig-Holstein Ticket. Rain looked set for the day so I ordered a taxi which was as usual exorbitant (€6.50 for a mile as the crow flies, and not a lot more as it doesn’t). Naturally by the time I reached the station platform the rain had stopped… The kart from Bad St Peter-Ording was a bit of a surprise, being a Dürener Kreisbahn unit. It went off P5, the same as yesterday’s Westerland - Elmshorn train so no problems with that. A lengthy and featureless trundle to Bad St Peter-Ording was interrupted only by an emergency stop at km 19, reason unknown, and the reversal at Tönning where the services cross. The incoming unit was a NOB one. Does your owner know? 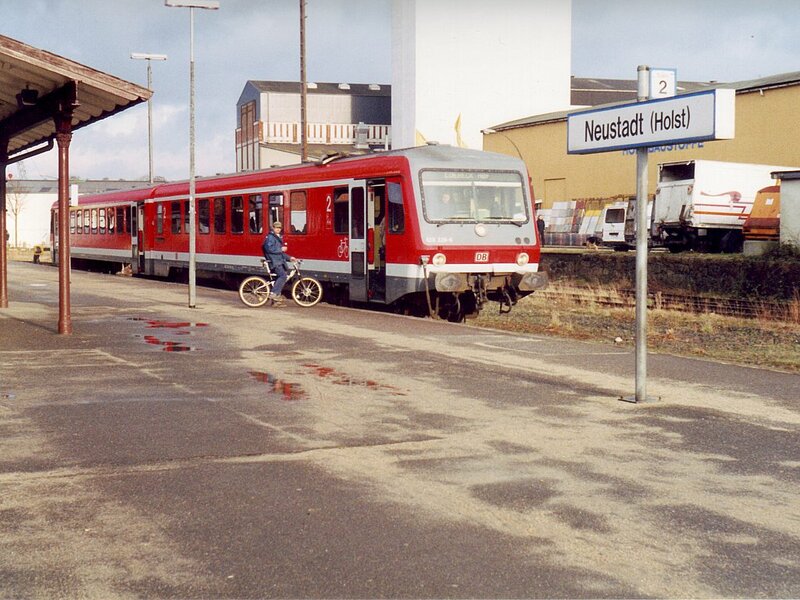 This Rurtalbahn unit is a very long way from home at the NOB-worked terminus at Bad St. Peter-Ording, 18.2.02. At Bad St Peter Süd the route is crossed by what looks like a railway embankment but isn’t high enough, neither does it appear in S&W. At Bad St Peter-Ording the loop has been disconnected leaving just a single platform. There are buffers just beyond the platform and it’s not clear if the line went further. Back at Husum there seemed to be just time for a beer so I marched (not all that much time) up to the quay where one of the pubs was open and advertising Flensburger Pilsener, which I had wanted to try. I’m now less enthusiastic about spending a night in Flensburg next month… Still, it was friendly enough and kept me out of the rain. The sun was out by the time I marched back again. Another NOB kart to Kiel, this time an ‘own brand’ one and with the same (slightly surprised) conductor as the Bad St Peter trip. Positively Alpine leaving Bad St Peter with the ground rising to, oh, easily 50 feet. On the whole it’s a bit less boring though, with the Rendsburg High Bridge as a highlight in all senses – an oval to do the climb on the north side and a bridge similar to the one on the Westerland line. Arrival at Kiel was more or less punctual allowing a quick Imbiss visit. Rabbits everywhere with 218176 very late at the rear of 1333 to Hamburg and 218489 on my 1340 to Lübeck (and going on to Rostock). Amazingly Kiel Hbf looks to be pre-1945 and is in a fairly tatty state. It’s also undergoing a major refurbishment and is, well, a shambles. 628 220 stands at the buffers at Neustadt (Holst.) on 18.2.02. On to Lübeck with the Rabbit over what by recent standards is quite a scenic line. The area’s label of Holsteinische Schweiz is a bit tongue in cheek to say the least, though. A quick change at Lübeck on to a 642 to Neustadt (Holstein). At the junction with the Lübeck-Puttgarden line there is no triangle (there was, but the third side is now lifted and covered by a builder’s merchant’s yard) but there is a loop which diverges quite a way of the main line before the Neustadt line goes off from the loop. The reminder of the loop might well be done by Oldenburg to/from Neustadt trains and would certainly be track if you’d done it… [It is, and it is because I have, now!] At Neustadt the line used to go across the road on to the quayside but it’s buffer stopped and disconnected now. Nothing for it then but to start the long ‘positioning move’ to Wilhelmshaven. Back to Lübeck first then by RB at 1705, with Rabbits fore and aft, to Hamburg Hbf. Arrival at HH-Hbf was punctual, giving enough time to queue at the Reisezentrum, for ages, ascertain that the Niedersachsen Ticket was the cheapest option, buy one, locate a beer supply and buy some of that, before getting a very wedged 1813 RE to Bremen. A long trudge to Bremen, with not much to commend it, including the beer which was from Hannover and best avoided. Probably belongs to Wal-Mart. Further supply obtained at Bremen ‘with typical North German taste’. Not much hope there, then. On to Oldenburg, on time again as was NWB’s kart for Wilhelmshaven which provided a comfortable ride and sufficient time to confirm my view of the North German taste. Then came Wilhelmshaven. What a place. Concrete wasteland of ultramodern shopping precincts, ultramodern cafés, mostly shut, ultramodern station, etc., etc. Nothing even remotely resembling a pub, or at least not open. And if they had been, they’d have sold Jever. Absolutely dreadful. I’ve never been so glad to see a McDonald’s in my life. The hotel, on the other hand, is across the road from the station and seems excellent. There are a few taxis cruising around, presumably looking for survivors. Woke to heavy rain, pretty much in keeping. Very good breakfast and pleasant people – certainly no problem with the City Hotel Valois, nor with the cheery DB man in the Reisezentrum. Nevertheless it was a relief to leave Wilhelmshaven on the 0900 NWB kart to Esens. At Sande the Wilhelmshaven and Esens lines join just north of the station so whatever antics may go on later won’t cause any difficulty. A heavy duty squall was encountered just after Esens – black sky, driving rain, lightning, the works. Shortly afterwards a military (I think) plane passed low overhead, trailing smoke. ‘Tis to be hope it stayed airborne; it looked OK as far as I could see. At Esens the wind was sufficiently strong to rock the train and make photography difficult. I somehow don’t see the Friesian Islands ferries running. On the return, Sande proved to be a bleak place to wait even for a minute or two. I managed to occupy most of the 11 minutes by going to the station shop for a can of pop. 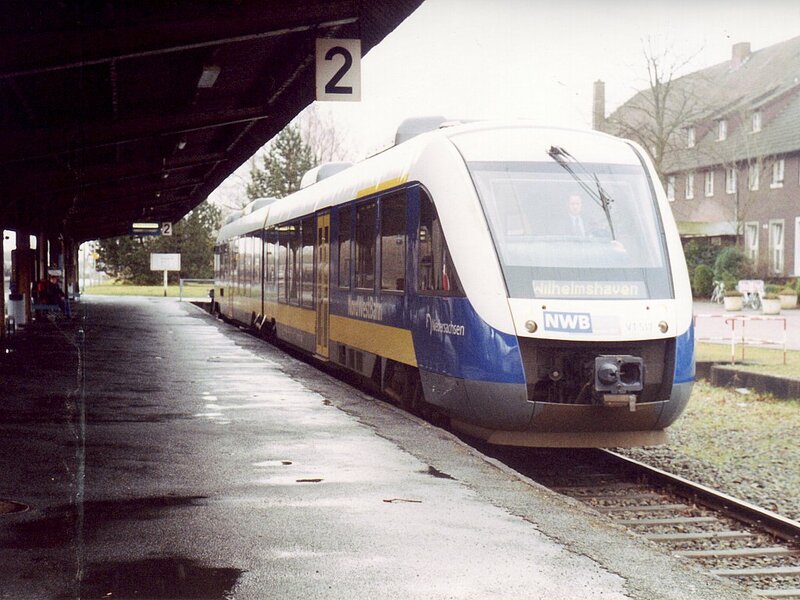 The Esens trains reverse in the bay platform leaving the one through platform for the Wilhelmshaven - Osnabrück trains. A 6 car (3 kart) train turned up for Osnabrück; all went well as far as Oldenburg but shortly thereafter we encountered a ‘track defect’ causing a 6 minute delay. This wasn’t serious (once away) but thereafter we were treated to announcements from the train crew of such length and complexity that I was getting seriously worried. A kindly English speaking person explained one (waiting to cross a northbound train) but despite all the flapping we were never more than 8 minutes late and arrived at Osnabrück Hbf about 7 late in good time for the Münster train which was waiting ‘upstairs’ on P1. On time at Münster, there was time for a refreshment stop and to decide that most of the Nokia phone covers on offer were poor quality and the rest too expensive! I had to get a VRR ticket so the next stage was a Münster-Dortmund RB as far as Lünen Hbf; this was full of kiddies and seemed to take an age. Ticket purchased, I awaited the Lünen-Dortmund shuttle which confused me by terminating in P1 on the Gronau line. This makes sense as there’s too much IC traffic on the Münster lines to have terminating locals cluttering up the platforms. A very short connection at Dortmund on to an RE to Düsseldorf via Bochum, Essen, Mülheim. Duisburg (I guess). And Wattenscheid as it turned out, not to mention D-Flughafen. All went well until just outside Düsseldorf Hbf when the (spectacularly grumpy) conductor informed us there was a delay. It was only 5 minutes in the event and we arrived at 1701 giving me a reasonable chance for the 1705 S-Bahn. Arrived on the platform at 1704 to find the S-Bahn service in serious disarray. Trains standing with their doors open, anything indicated at all indicated as at least 25 late, etc., etc. Worst of all, the indicators were spinning round showing all sorts of nonsense. One stopped for a while showing D-Flughafen, Duisburg, Essen so I dived in thinking the next train to D-Flughafen and the bus looked sensible. As we left D-Hbf sixth sense said that despite the indicator, this might be an Essen via Kettwig train and since the indicator at the next station said it was, I dived out again! It was, too. As luck would have it the next train was the 1645 S7 from D-Hbf to the airport, 25 minutes late, so that solved my problem at a stroke and I arrived at the airport at 1720. The remainder of the evening was strictly routine. An A319 offered rather more space than the Embraer and got me to BHX about on time, then CT back to Telford for around 2140. I went back to north west Germany three weeks later, to finish the job!